32/55 Reagen Sulewski Considering I hated the first, this is high praise. At least it's internally thematically consistent this time. 42/126 Kim Hollis Superb animation plus laugh-out-loud humor means fun for all ages. 48/92 David Mumpower Either I'm sane and everyone else is crazy or vice-versa. In 2001, DreamWorks fired a shot heard ‘round the world, but especially by Disney. Shrek was a CGI extravaganza that took five years to produce, but by the time it was all said and done, it had accumulated $267.7 million in domestic box office receipts, $202 million overseas, and an Academy Award for Best Animated Feature. Not only did it trump the mouse house’s Monsters, Inc. with bigger numbers and more awards, but the movie poked a lot of fun at Disney stereotypes and was widely enjoyed by insiders from the industry. It’s only natural, then, that the studio would follow up the film with a sequel, especially since prep time is considerably shorter thanks to the fact that the major characters are already created and rendered. For Shrek 2, the three major voice actors will be returning to reprise their roles, including Mike Myers as Shrek, Eddie Murphy as Donkey, and Cameron Diaz as Fiona. 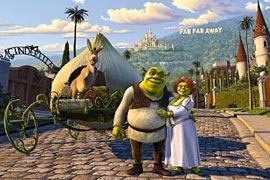 According to DreamWorks executive Jeffrey Katzenberg, the new story will revolve around the fact that Fiona’s parents have heard that their daughter has married her true love, leading them to invite the couple to their kingdom, known as Far Far Away. When the happy couple arrives, naturally the folks are a little bit shocked. They had assumed she had fallen in love with Prince Charming and are extremely surprised to realize that their new son-in-law is a 700 pound ogre with bad hygiene and a talking donkey. In fact, Katzenberg even describes it as Guess Who’s Coming to Dinner meets Shrek. Playing the part of Fiona’s parents are Julie Andrews and the always-hilarious John Cleese. In fact, Cleese got his start in radio and compares his experiences on Shrek 2 to those early beginnings, saying that he actually prefers this type of work. Rupert Everett will provide the voice for a understandably pissed off Prince Charming (we're confident that Rupert will bring the snark). Jennifer Saunders, creator and star of Absolutely Fabulous, will play the obligatory Fairy Godmother. Antonio Banderas plays Puss in Boots, a flashy, egomaniacal Zorro-esque (mmmmm, cross movie synergy) character.